North America’s St. Lawrence water system – which includes the Great Lakes – is one of the largest in the world, and is responsible for draining more than a quarter of the Earth’s freshwater reserves. The artery of this system, the St. Lawrence River, reaches deep into the interior of this massive continent, connecting the Great Lakes system to the Atlantic Ocean. To celebrate Water Wednesday with WWF and Love Nature, let’s look at five facts about this diverse waterway. 1. This river is massive! The St. Lawrence is enormous. The river proper, at 1,197 km in length, runs northeast from Lake Ontario towards the Atlantic, where it forms the Gulf of St. Lawrence. All in all, the whole St. Lawrence system is 3,058 km. This behemoth of a river is still fairly young, having only formed around 10,000 years or so ago when the glaciers began retreating, exposing a giant gash in the Earth’s crust. Because it flows through such a vast portion of the continent, the river has many different habitats, ranging from Great Lakes freshwater systems all the way to the saltwater ocean environments of the estuary. There are around 83 different documented land and aquatic mammals that call the river and its associated gulf home, including the much adored and endangered beluga whale. Before they were hunted to extinction regionally in the northwest Atlantic, walruses used to swim here too. Part of the Atlantic Flyway, the river is a hotspot for at least 400 species of birds, such as bald eagles, ospreys, and black terns. When it comes to the depletion of fish stocks, years of pollution and commercial fishing has had massive impacts. The fishing communities that first drew Europeans into the eastern ocean-facing mouth of the river aren’t what they used to be. Herring, sturgeon, and salmon have all been fished to a fraction of their historic populations. Sports fishing enthusiasts still flock to stretches of the river famous for their small and largemouth bass, northern pike, carp, and muskellunge (a.k.a. muskies). To reverse the decades of commercial over-fishing, research and funds are going into restoration and turning around the plight of some of the river’s most iconic species. WWF’s Loblaw Water Fund, for example, supports on-the-ground restoration work across Canada and in the St. Lawrence River watershed. The beaver, mink, muskrat, and fox populations historically decimated by the fur industry have gotten a lot of help over the years from government and private groups. Most populations are on the rebound, but beavers and muskrats are still under pressure in some regions by development and human encroachment. There’s an enormous wealth of plant life in the many various ecosystems along the river, some 1,700 species we know of right now. That includes species of the beautiful and rare lady’s-slipper orchid, and some curiously named specimens like Fernald’s milkvetch, Connecticut beggarticks, handsome sedge, and Philadelphia fleabane. One of the most significant opportunities to restore the health of this ecosystem involves managing the flow of the river and lake levels in a way that reflects a more natural state. A new plan, Plan 2014, is coming together and if implemented would has unprecedented restoration potential. Settlers began constructing canals to control boat access along parts of the river and the Great Lakes as early as 1783. By 1932 Canada had already linked Lake Ontario and Erie, but the US was still wary of a mutual project. By 1954 they were finally convinced, and in 1959 the mutually constructed St. Lawrence Seaway and Power project opened, connecting Montreal to Lake Erie. Economically speaking, the project was a huge success for both countries, and the feat is still deemed an inland-water engineering marvel. But progress often brings problems. Invasive species that hitched a ride on incoming vessels now line the length of the river, and have been causing serious concern for decades now. At least 85 invasive aquatic species have been cited in the river itself, and more than 180 non-native and invasive species exist in the Great Lakes. Zebra mussels are probably the most well-known example. They were first spotted in the Great Lakes in the late 1980’s, and they’re now spread throughout the entire system, choking out competitors such as native freshwater mussel species. Like just about every other waterway in the world, the St. Lawrence system is under threat from the usual myriad of stressors such as, development, over-harvesting and pollution. Another concern is the possibility of oil spills from boats and underwater transport lines. 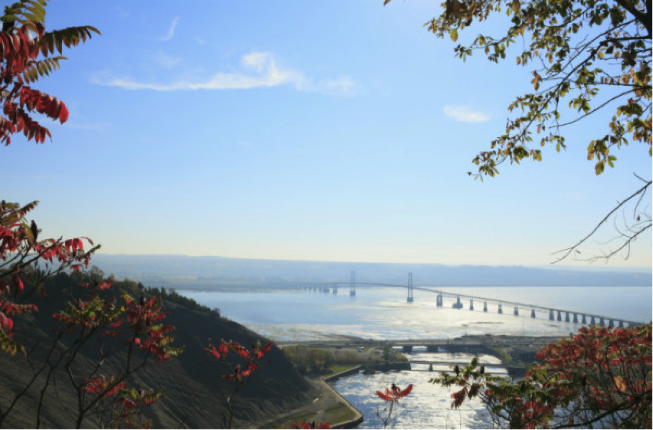 And just last year, McGill University researchers uncovered microplastic pollution levels in the St. Lawrence on par with the most contaminated ocean sediment samples.